I was in Las Vegas over Labor Day weekend to see Ringo Starr and His New All-Starr Band at The Rio. 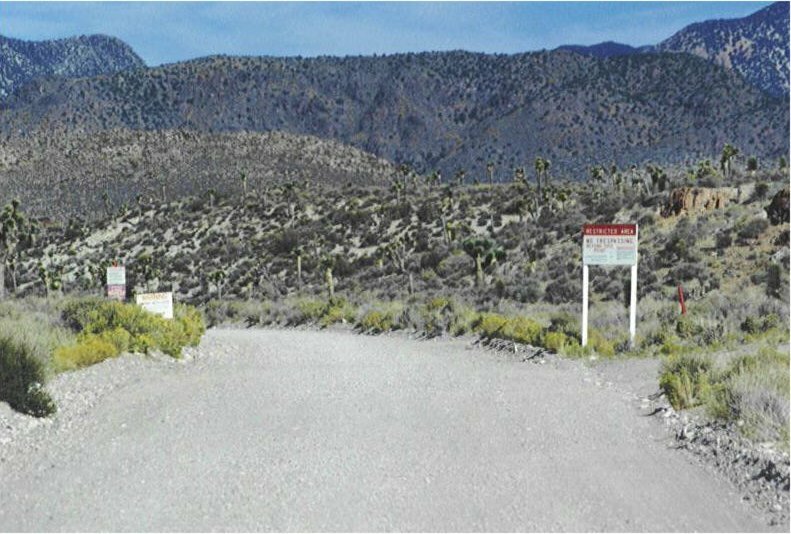 Since I was that close, I had to take the opportunity to see Area 51. Well, "see" may not be quite accurate. Let's say I took the opportunity to "visit" Area 51. On Labor Day, Monday, September 3, I got in my rented Chevy Blazer about 6:15 a.m. and headed north. The trip up I 15 to US 93, was uneventful to say the least. I stopped in Alamo to top off the gas tank. (If you don't get gas there, do it just up the road in Ash Springs-or else.) A few miles later I turned onto Nevada 375, The Extraterrestrial Highway. Even though the Sun was rising, the temperature outside was dropping do to my altitude gain. 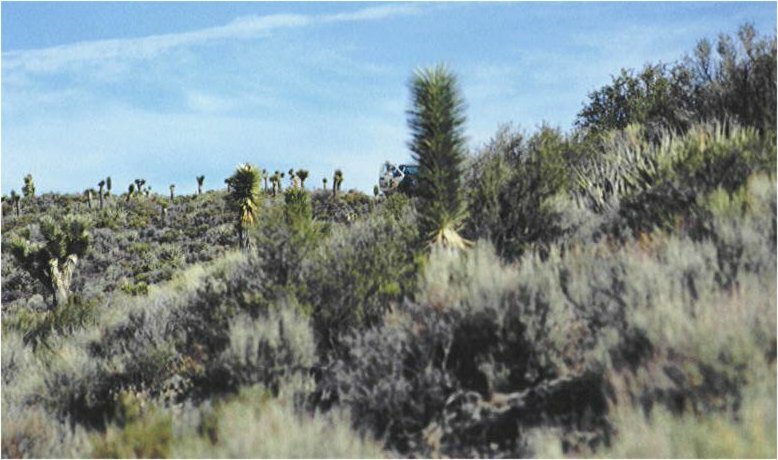 At one point, the Blazer's digital thermometer dropped to 68 degrees F. While descending from the Hancock Summit, I got several very clear views of the Groom Lake Road off in the distance. It's hard to miss it. 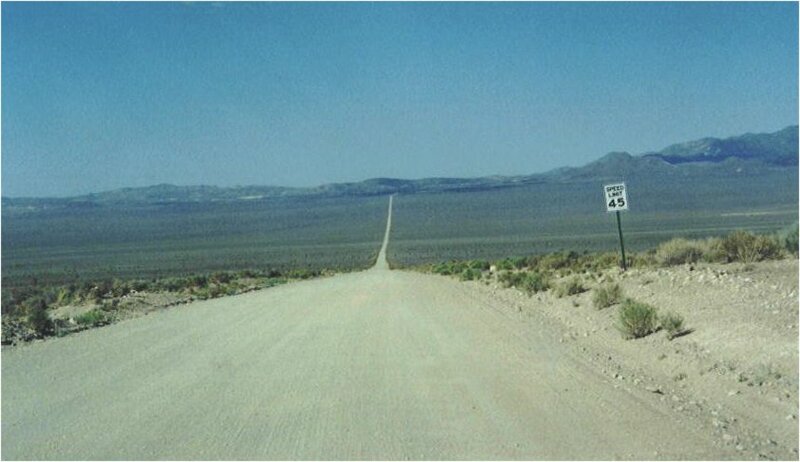 I reached the valley floor and about half a mile past the Mile 35 marker, I turned on to Groom Lake Road itself. I stopped for a minute and surveyed the 14 mile long dirt road as it stretched out in front of me almost to the horizon. I couldn't see any other vehicles, or the dust from any other vehicles, between me and the south entrance to Dreamland. I headed up the road a little below the posted 45 mph speed limit. (While the road is fairly well maintained, there are some pretty deep ruts here and there that will throw you from side to side if you aren't careful. If you have a vehicle with very little clearance, be careful. Also, there are some areas just off the road on the right that drop off a foot or two. If you get off the road into one of these "ditches," you may need help getting out.) There's really no need for any fancy electronic surveillance devices to detect someone coming up the GLR. You create a dust cloud behind your vehicle that can probably be seen for miles! I kept scanning the side roads and the hills in front of me for the "Cammo Dudes." I was about two-thirds of the way to the gate and beginning to get disappointed that I hadn't seen any security personnel when a pick-up truck came roaring out of the dust cloud behind my Blazer and zipped past me in the left lane. (Obviously exceeding the speed limit.) Fortunately, I had the windows rolled up because they gave me a thorough "dusting." I had to slow down and wait for the dust to clear. Finally, I could see the cloud behind the pick-up in front of me as it climbed up the hill to the right of the south "gate." 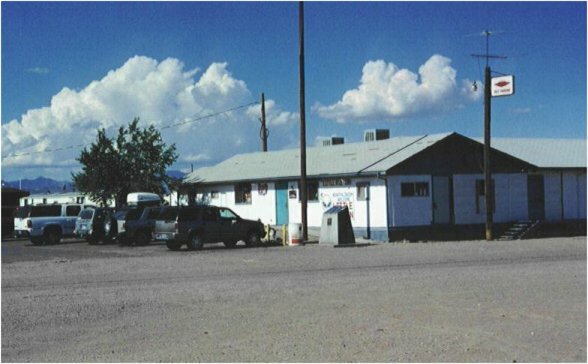 I was going to park in the so-called "K-Mart" parking lot about a quarter of a mile from the border and walk up to warning signs. Unfortunately, I went past the turn off before I realized it. Already being watched by the Cammos, I decided to drive up closer to the signs and park as far to the right as I could behind the little hill outside the border. I stopped where the Cammos couldn't see me from their vantage point and got out of the Blazer and began taking photographs and shooting video. Within less than a minute, the Cammo pick-up truck had pulled up to a different spot where they could see me. The Cammo Dude on the passenger side got out of the truck and stood behind the open door. After watching me take pictures for a few minutes, the passenger Cammo got back in the truck and the driver started the engine. I wasn't certain if they had finally figured out I was just another silly tourist and they were going back to the guard house OR if they were already mad for having to work on Labor Day and they were going to get rid of me by giving me a hard time for parking on the road. Discretion being the better part of valor, I decided I had enough photos and video and got back in the Blazer. I did a nice little "Y" turn and headed back toward the ET Highway. I kept glancing in my mirrors as I retraced my route up the GLR. However, I never saw anybody tailing me. When I reached pavement again, I turned left and headed toward Rachel. About five miles later, I stopped at the "Black Mailbox." for another Kodak moment. Of course, the Black Mailbox is painted white now and covered with graffiti. After a minute or two of enjoying the amazing (eerie?) solitude, it was back in the Blazer and on to Rachel. 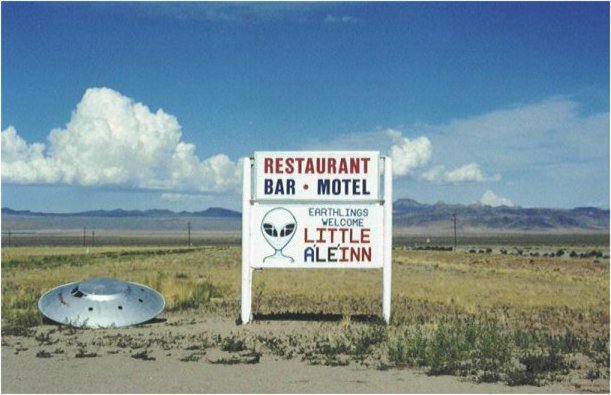 I stopped at the Little A'Le'Inn in Rachel for an Alien Burger and then visited the Area 51 Research Center in "downtown" Rachel. After that, it was back to Vegas-where the temperature hit 102 degrees on the Blazer's thermometer. All in all, another successful pilgrimage to Dreamland.